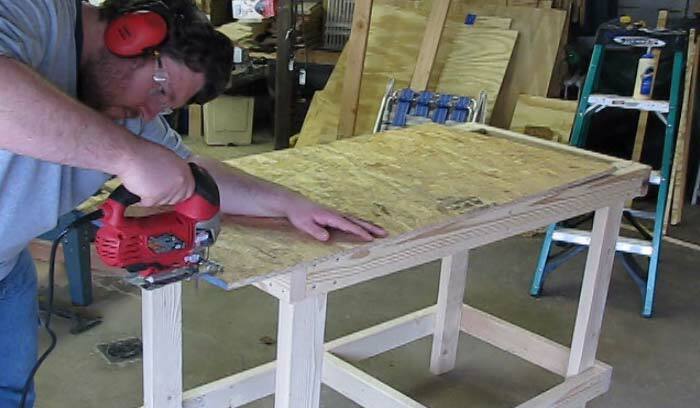 Workbenches just aren’t for woodworkers. Take a peek into any garage around and you’ll see a different design behind every door. 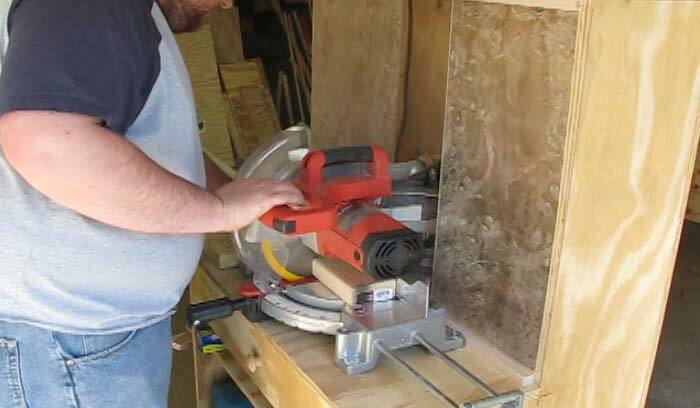 This project is a very limited tools project (electric drill, circular saw, jig saw). 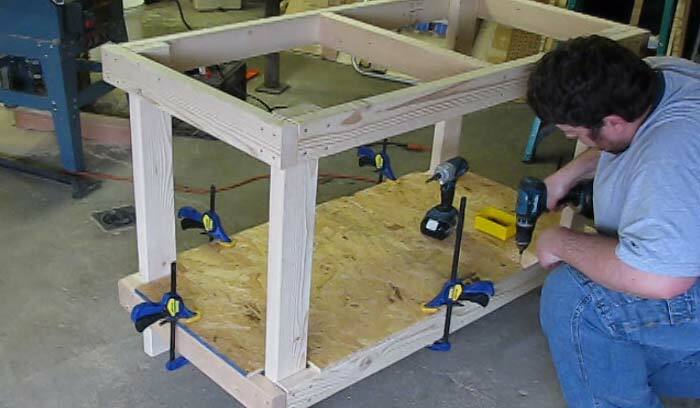 While I did use an impact driver and a miter saw, the build is still very easy to do without anything fancy. 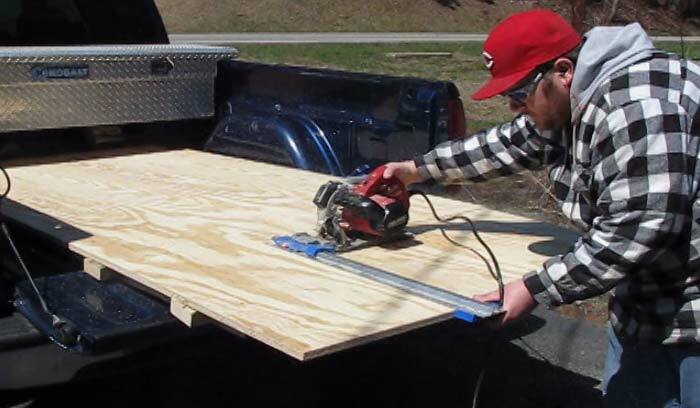 With pre-cut plywood being available at most Blue/Orange stores, you don’t even have to deal with a big sheet expensive of plywood if you don’t want to and I left the tablesaw out on purpose. 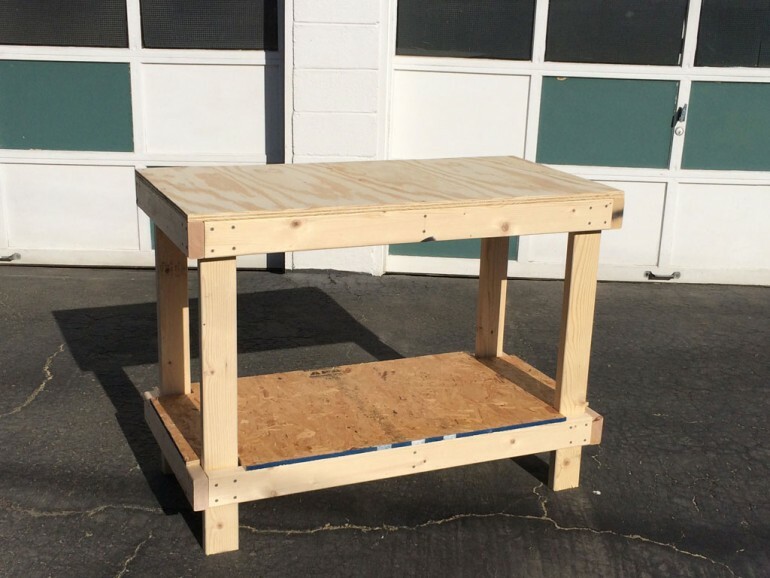 If you decided to build this using plywood for the top and OSB bottom surface, you could have as little as $50 in this bench it serve most people well. Of course, OSB isn’t as strong as plywood nor does it look as nice but it gets the job done. 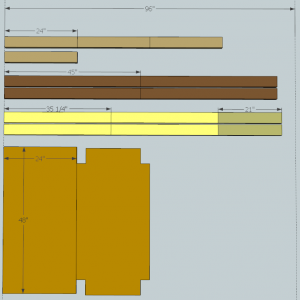 Note: Since a 8′ board is exactly 96″ long, three saw cuts in the middle eliminates about 3/8″ of the board when it’s cut three times. This is the reason we need the sixth board. If you have any scrap, feel free to use it and save the $3. First using the cut-list, chop everything down to size and then rip the plywood down (if you didn’t buy a pre-cut sheet). 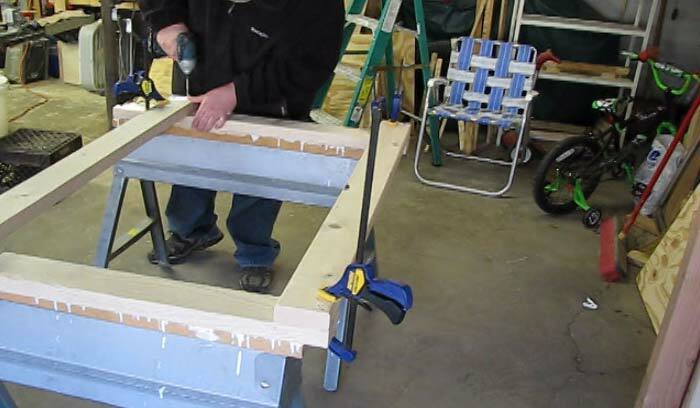 Start making the front and rear leg frames in a ” double H” formation. 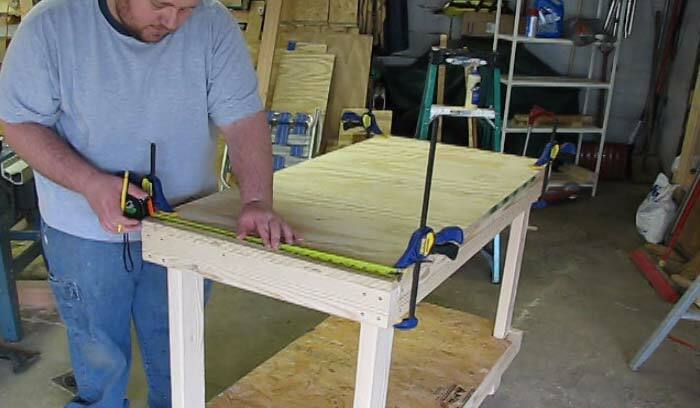 Use a framing square to get things close and clamp the joint together. Put one screw in the corners of each joint but don’t drive the screws flush yet. This will allow us to more easily adjust for square. Now measure the diagonals; if the frame is perfectly square, both measurements should be exactly the same. If are not, pivot the frame in one direction and remeasure. 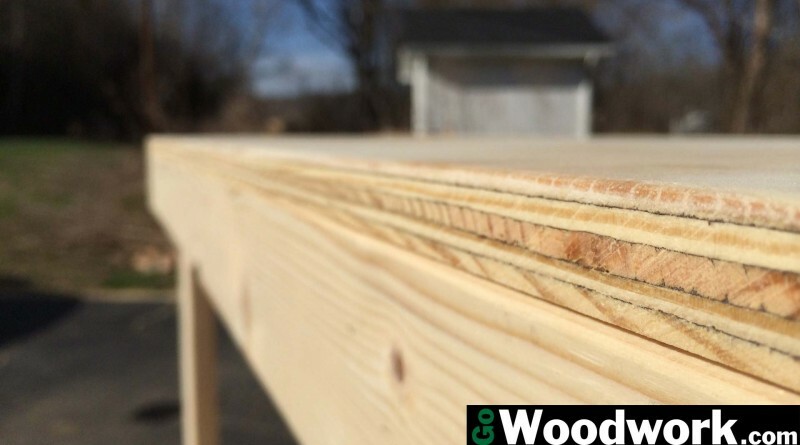 Since this construction timber (typically has bows and warps), try to get the measurement down to about 1/16″ difference. 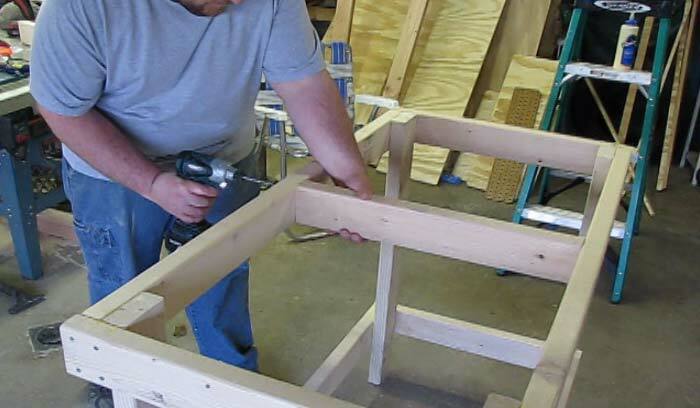 Once the frame is square , drive another screw into each joint, again not driving them flush yet. This “locks” the position of the frame by providing you two reference points. Remove the 2 screws from one joint and apply glue. 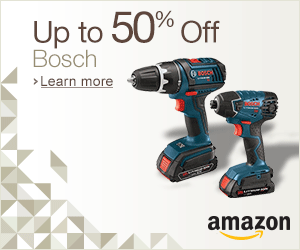 Carefully put the screws back into the same holes then drive them flush. 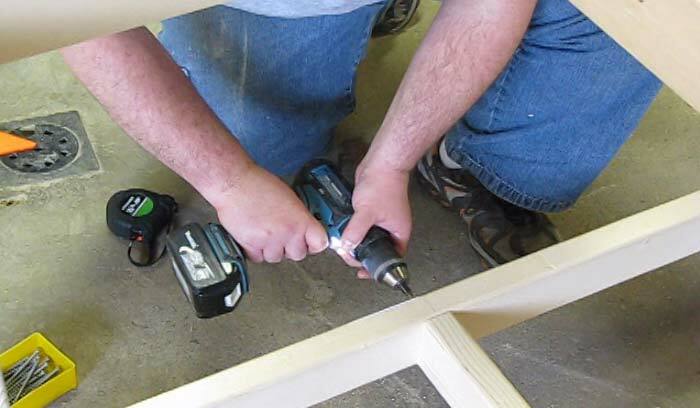 Add an additional pair of screws to each joint and drive flush. 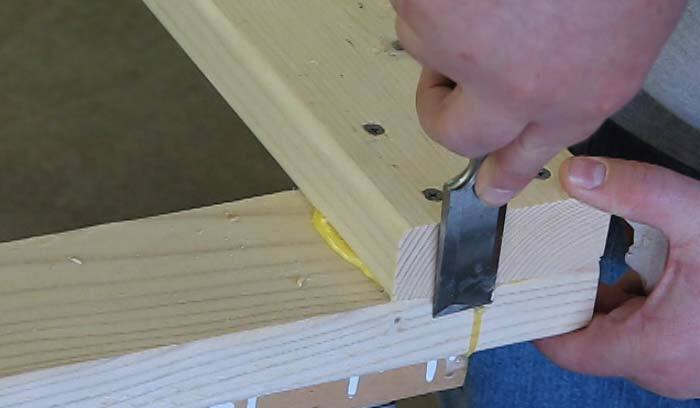 After the glue has dried for about 30 minutes, cleanup any squeeze-out with a chisel (putty knife will also work). 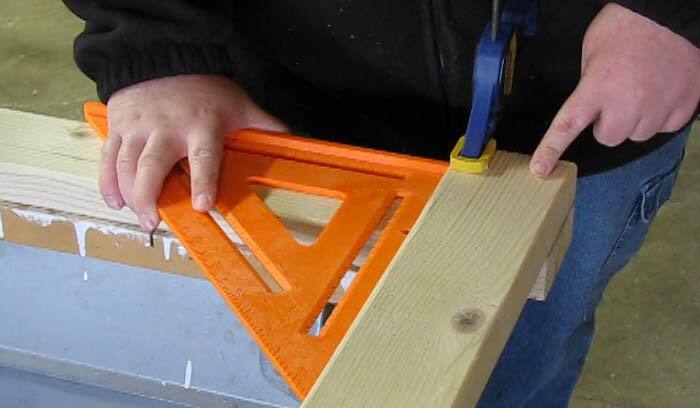 Repeat the same steps above for making another identical frame. 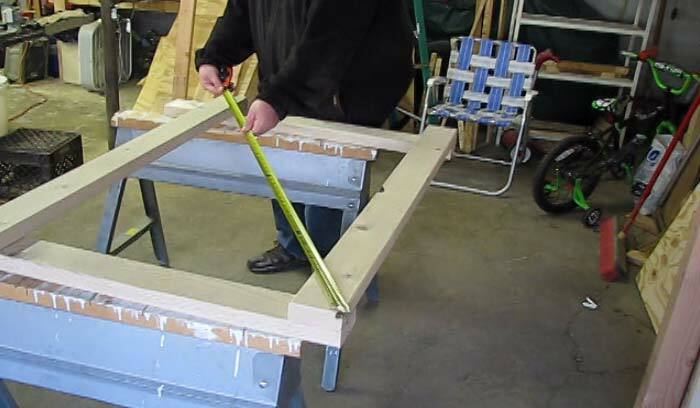 With the frame now laying on it’s side, use a framing square to line up the side stretchers. Use two screws to “lock” the location and then glue the joint. 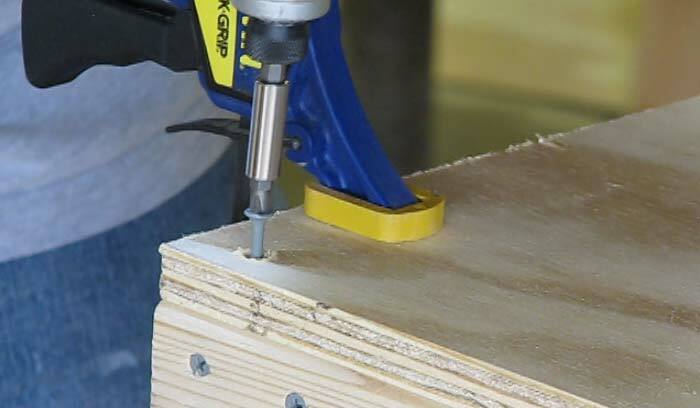 Use the same method as before to apply glue and finish by adding two additional screws. Move one frame so that is sitting on the top and rotate the other frame 180 degrees so that they will mate together. 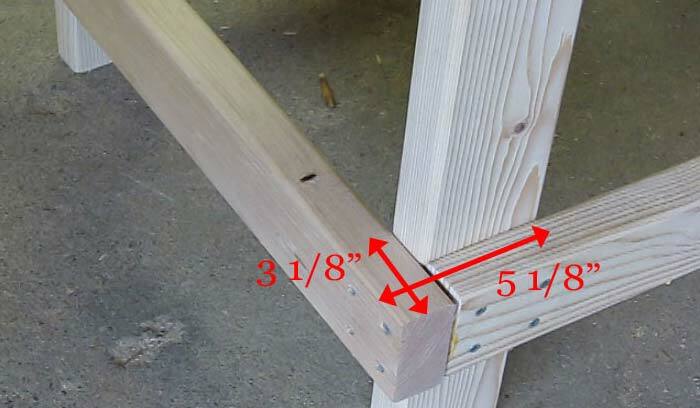 Make sure that each joint is flush and screw/glue (as before). 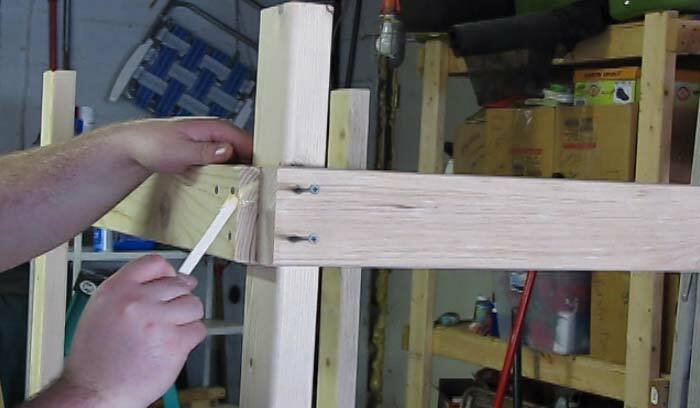 A small sliver of wood or Popsicle stick works great to get into the tight area. Next, take your center stretchers and attach them to the frame. 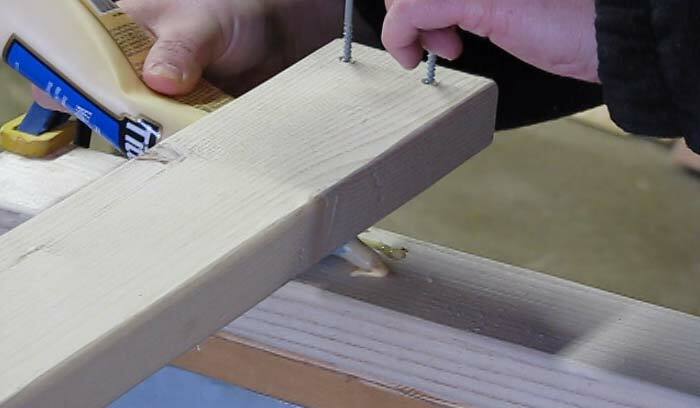 You may need to use a clamp to take any bow out of the structure. With all of the cuts being perfect, this will ensure that your top is flush on all sides (21″ stretcher + 1.5″ side rail + 1.5″ side rail = 24″ wide workbench). 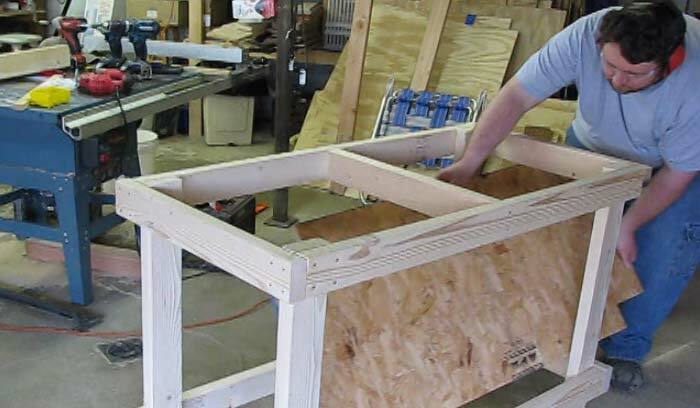 Lay the bottom shelf into the frame by inserting it diagonally. Secure it with screws. 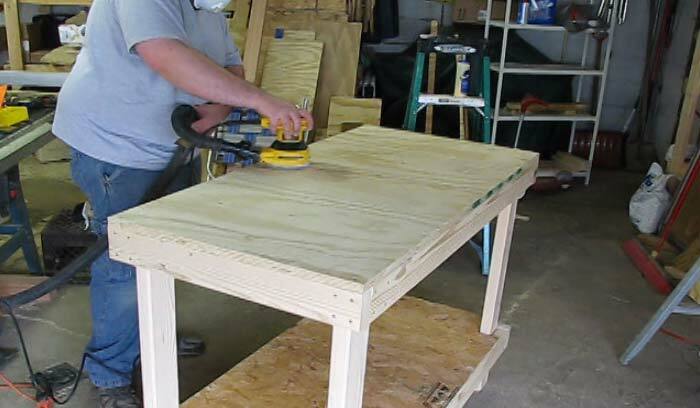 Pre-drill and counter-sink each hole to keep the wood from splitting. 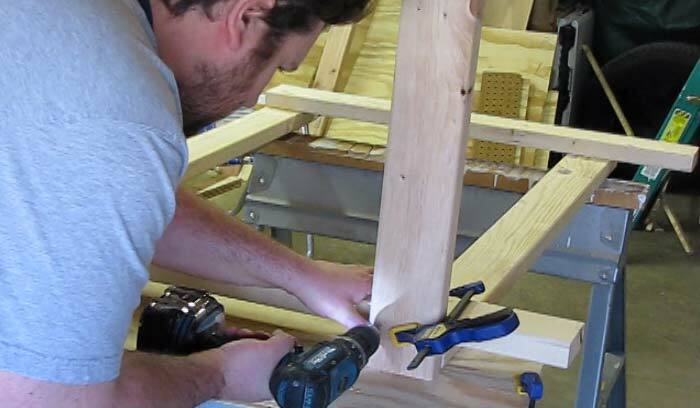 By doing so, you can easily get a screw in without compromising the edge. Give the benchtop a good sanding and if you aren’t applying a protective finish, then 80 grit is adequate. I’m really glad I decided to build this bench. When I first started doing this, most of the plans out there were either expensive or were too complicated to follow as a beginner. This bench is more than sturdy enough to hold anything you can throw at it. Go ahead and mount that vice and get to work!